We are a leading and prominent manufacturer and supplier of a broad variety of Double Sided Foam Tape. 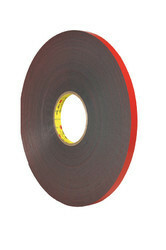 Available in varied lengths and designs, this foam tape finds application in packaging industry. The offered foam tape is designed and manufactured in adherence to set industry standards and is available at competitive prices. Further, this tape is tested on stringent parameters in order to ensure its flawlessness. Our domain expertise enables us to offer an excellent collection of VHB Acrylic Double Sided Foam Tape. Offered foam tapes are available in different designs & sizes for fulfilling the diverse requirements of our clients. Our experts utilize best grade raw material for designing these tapes, making them widely demanded in the market. Further, these foam tapes are tested on various quality parameters by our experts. We are providing an exclusive range of Double Sided Foam Tape (Black & Green - Pressure Tape) that is available in diverse dimensions in order to fulfill the requirements of our esteemed clients. In order to ensure its quality, our professionals test this tape against wear & tear. Designed using superior grade raw material, the offered foam tape is broadly used by various companies for packaging various materials.